Accept no substitutes! Stay ahead with the most trusted, comprehensive, and up-to-date fire and life safety resource -- NFPA®'s fully revised 20th edition Fire Protection Handbook®. In a field as wide ranging and dynamic as fire protection, staying current with the latest research, technology, and safety practices is as challenging as it is essential. The fully updated, new 20th edition FPH® provides state-of-the-art, in-depth coverage of every aspect of fire protection so you can eliminate knowledge gaps, avoid errors, and maintain your competitive edge. 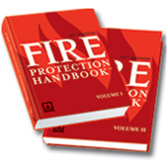 Two volumes with 3,500 pages cover the total spectrum of fire protection issues. 211 chapters, including 25 that are brand new to this edition, reflect the latest knowledge and tactics. 254 leading authorities provide answers and solutions on demand. Thousands of visuals -- including 500 added photos, tables, charts, illustrations, and diagrams -- aid comprehension. Premises Security explores how to incorporate architectural, technical, and operational security elements into a comprehensive and effective security plan. Protecting Against Extreme Events outlines how to increase a building's resilience to such events and better protect its occupants. Flammability Hazard of Materials discusses test methods for measuring and characterizing ignitability, heat release rate, flame spread propensity, smoke yield and extinguishability components of flammability hazard for solid combustibles. Strategies for Occupant Evacuation During Emergencies examines considerations that include building characteristics, occupant characteristics, criticality of building operations; and, outside influences such as weather or the threat of violence. New features make it easy to navigate massive amounts of information. Smaller, more focused sections streamline research. Easy-to-use tabs (included) provide instant access to specific topics. An individual table of contents for each chapter maximizes searching efficiency. A new two-color format makes captions, subheads, and bulleted information stand out clearly.